Even if you don't exactly subscribe to the woo-woo–leaning philosophy of healing crystals, the aesthetic appeal is undeniable—which is why it's unsurprising that the beauty industry has capitalized on this kitschy-cool New Age trend in a big way. 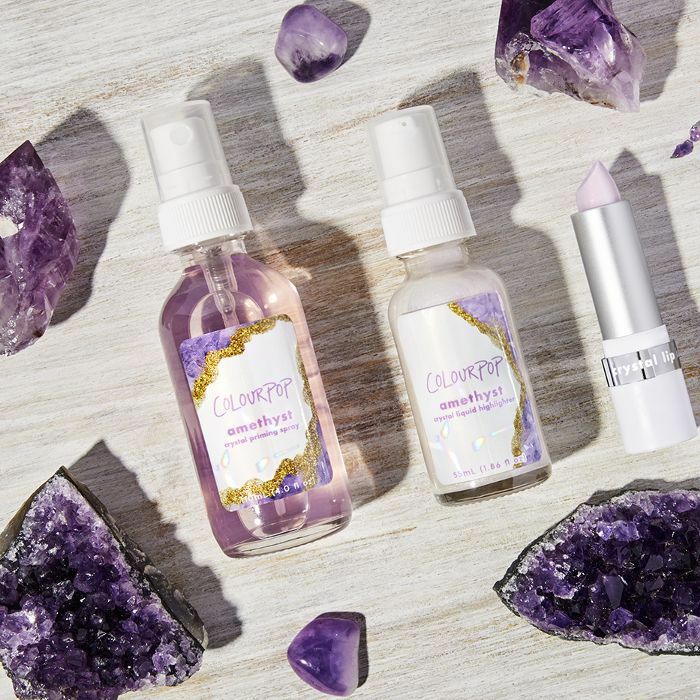 We've already seen our fair share of crystal-infused face mists, body oils, and even eye creams—and now, one of the buzziest makeup brands of the moment is getting in on this corner of the market. ColourPop is launching its limited-edition Crystal Collection on June 28, which will feature an array of products infused with crushed stones. The cult-loved brand will offer different variations of the same Crystal Priming Spray ($6), Crystal Setting Spray ($6), Crystal Liquid Highlight ($6), and Crystal Lip Balm ($5)—basically, you get to choose between crystals like amethyst, rose quartz, and aquamarine, according to the energy properties (or color) you're looking for. Aquamarine is a protective stone associated with courage and overcoming inhibitions. Rose quartz is closely associated with love—romance, sure, but also self-care and appreciation. Amethyst is therapeutic and detoxifying. Azalea Lee, an L.A.-based crystal healer, recommends using it to wind down from a stressful day and to quiet mental chatter. Adventurine boosts creativity and imagination. Shop the collection on ColourPop's website starting tomorrow.